Laparoscopic urology deals with urological surgery for which a laparoscope is used (a laparoscope is an instrument consisting of a telescope with a camera or other visual device attached to it). Laparoscopic surgery is advantageous because only a small incision is made for surgery, as compared to open surgery. Consequently, the recovery time of the patient is reduced. Furthermore, the surgeons’ hands are freed so that they can work better with their instruments. Laparoscopy has revolutionized surgery by providing the means to perform minimal access (keyhole) surgery. 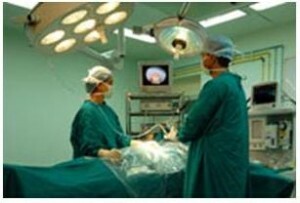 A wide range of laparoscopic surgeries is performed at NU Hospitals. We are one of the few hospitals performing laparoscopic live donor nephrectomies, apart from adrenalectomies, renal cyst decortications, ureterolithotomies, nephrectomies, radical nephrectomies, etc.